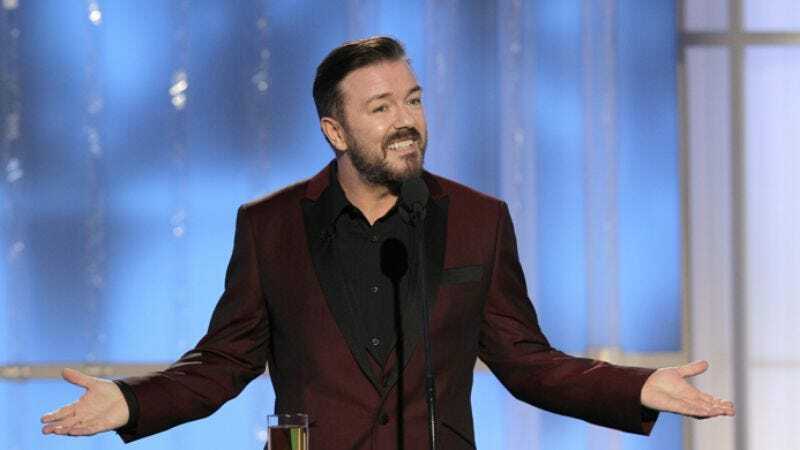 Suggesting that Ricky Gervais' name no longer carries the cachet one would expect in the fine art world, a painting the comedian donated to a charity auction failed to attract a single bid, raising $0 for the Maggie's Cancer Caring Centres network in the UK. Gervais submitted his artwork—a rendering of a cityscape at sunset titled "Sunset Cityscape," in keeping with his passion for the mundane—to Inchmore Gallery as part of an exhibit showcasing artists who had been affected by the disease, having lost his mother to lung cancer in 2000. Yet although the gallery owner lauded it as "interesting and well-executed," even adding, "Personally, I love the way he has painted the sky," bidders were notably less impressed by Gervais' skill or the "fantastic opportunity for someone to own a unique piece of art painted by a celebrity comedian whose work as an artist is rarely available for sale." "Is he having a laugh?" someone probably said, hourly. Anyway, the piece will now be made available for other auctions, where hopefully it can find a fan who appreciates Gervais' increasingly broad, derivative strokes.